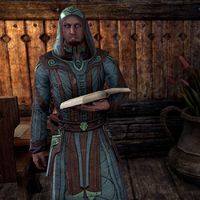 Prelate Sabinus is an Imperial member of the Mages Guild found in the halls located in the cities of Evermore, Rawl'kha and Riften. "May Arkay drive back the darkness, forever more." I was attacked by a vampire. I fear I may become one of them. (Unknown alternate dialogue) "You have no doubt sinned greatly due to your affliction, but fear not. Arkay's grace can purify you, if you truly desire forgiveness.\n\nConsidering the weight of your sin, I must ask for a donation to the temple before I can purify you." "Those wretched creatures slink in the darkness, cowering from the light of Arkay. Fear not, with Arkay's grace I can purify you. All I ask is a simple donation to the temple." Now, let Arkay's light burn the curse from your blood." I won't pay for your cure. "Arkay protect you, my child." "Yes. The blood-curse is gone from you. Terrible dangers, such as werewolves and vampires, crawl in the darkness. Should you fall victim to their infection, know I will lift the evil with the light of Arkay." This page was last modified on 16 June 2018, at 17:43.